Vanessa Morgan Mziray (born March 23, 1992), known professionally as Vanessa Morgan, is a Canadian actress. She is known for her roles as Beatrix "Bird" Castro in the MTV teen drama series Finding Carter, as Amanda Pierce in the Family teen comedy series The Latest Buzz, and as Sarah in the Disney Channel/Teletoon original film My Babysitter's a Vampire and the television series of the same name. 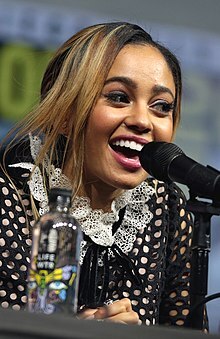 She currently plays Toni Topaz on The CW teen drama series Riverdale. Morgan was born in Ottawa, Ontario. Her father is East African and her mother is Scottish. Morgan won the Junior Miss America 1999 pageant and graduated from Colonel By Secondary School in 2010. She studied philosophy at Queen's University. Morgan made appearances in the VH1 original film A Diva's Christmas Carol in 2000 and another appearance in the movie Frankie & Alice in 2010. She became known in 2007 for her role of Amanda Pierce in the Family comedy series The Latest Buzz as well as performing the theme song for the series. She also played Marion Hawthorne in the 2010 Disney Channel original movie Harriet the Spy: Blog Wars. The following year, Morgan played Sarah in the Teletoon/Disney Channel original film My Babysitter's a Vampire, as well in the television series of the same name. Morgan also appeared in the 2011 Disney Channel original film Geek Charming. She had a recurring role in season 2 of the Disney Channel comedy series A.N.T. Farm. In 2017, she joined the main cast of the fantasy drama series The Shannara Chronicles as Lyria for the second season on Spike. Morgan was then cast in the recurring role of Toni Topaz in The CW teen drama series Riverdale. On May 2, 2018, it was announced that Morgan would be a series regular for the show's third season. 2013 Saving Hope Ricki Wilkins Episode: "Why Waste Time"
^ "Cast bios for Geek Charming - Vanessa Morgan "Hannah"". Disney Channel Medianet. Archived from the original on October 22, 2011. Retrieved October 22, 2011. ^ @VanessaMorgan (July 15, 2011). "Yes I'm canadian! but my mother is scottish and my father is east african so yes I'm mixed" (Tweet) – via Twitter. ^ Miller, Jacquie (July 24, 2017). "Ottawa actress cast in Riverdale, the hit series based on Archie comics". Ottawa Sun. Retrieved March 3, 2019. ^ Berry, Jennifer (July 26, 2017). "Meet Canadian actress and new star of 'Riverdale' Vanessa Morgan". Hello!. Retrieved March 5, 2019. ^ Amatangelo, Amy (September 15, 2014). "Catching Up With Vanessa Morgan of Finding Carter". Paste Magazine. Retrieved March 24, 2018. ^ a b Miller, Jacquie (July 24, 2017). "Ottawa actress cast in Riverdale, the hit series based on Archie comics". Ottawa Citizen. Retrieved August 20, 2018. ^ "The Celebrity Dish Twenty Minutes with Bruce McDonald and Vanessa Morgan". UrbamMoms.ca. October 5, 2010. Retrieved February 6, 2019. ^ Jake, Robillard (August 8, 2017). "Riverdale Welcomes Ottawa Native as First Bisexual Character". Ottawa Life Magazine. Archived from the original on March 24, 2018. Retrieved March 24, 2018. ^ Jancelewicz, Chris (June 27, 2013). "Vanessa And Celina, 'Amazing Race Canada' Team: Ex-'Degrassi' Actress And Bikini-Model Sister Join Game". HuffPost Canada. Retrieved March 24, 2018. ^ Petski, Denise (February 1, 2017). "'The Shannara Chronicles' Rounds Out Season 2 Cast As Production Begins In New Zealand". Deadline Hollywood. Retrieved September 25, 2018. ^ Lofaro, Joe (July 24, 2017). "Ottawa-born actress Vanessa Morgan to star in hit Netflix series Riverdale". CBC News. Retrieved September 25, 2018. ^ Holbrook, Damian (May 2, 2018). "'Riverdale' Ups Vanessa Morgan & Charles Melton to Series Regulars for Season 3". TV Insider. Retrieved May 2, 2018. ^ Patch, Nick (December 13, 2013). "Amazing Race Canada sisters reflect on first season". Toronto Star. Retrieved July 21, 2016. ^ Siegel, Tatiana (April 19, 2018). "Lee Daniels Boards Lesbian Love Story 'Pimp' as Producer (Exclusive)". The Hollywood Reporter. Retrieved April 21, 2018.